Yes, I AM a superhero (in my own mind). The truth is that I am the opposite of a superhero because I cheated. Please don’t tell my children because they are learning NOT to cheat at this very moment. whole grain whole wheat flour, molasses (soy lethicin), brown sugar, baking soda, ginger, cinnamon, salt, cloves. I found this mix next to the more conventional Betty Crocker mixes in the baking aisle. It might also be in the “natural foods” section of your grocery store. I was going to simply add a 15-ounce can of pumpkin puree and call it done. My goal was a TWO ingredient gingerbread but I couldn’t do it. The batter was too much like paste and I worried that the absence of fat would turn it into something that tasted flat. I added an egg (because it is nutritious) and ½ cup of milk to get a pretty delicious bread. Is it as good as one with a stick of butter? Noooo. But, it has a nice flavor and I love that it is whole grain. One slice has 111% of your daily value of vitamin A and 21% of your daily value of iron. Yes! Have you tried to “doctor” mixes? Please share. This sounds really good. Does it taste "pumpkiny" at all? Or does the "gingerbreadiness" shine through? I love easy and nutritious in a baked item. YUM! Thank you! I have been looking for a healthy alternative to the canned pumpkin/Duncan Hines spice cake mix combo. Definitely want to try this. I've been doing the same thing with whole grain pancake mix to make pumpkin pecan pancakes. I'm close to perfection! Can I use egg substitute in place of the 1 egg? A little less calories/WWPP. I bought a Kroger brand pumpkin boxed quick bread today, and used 1 container of 2% greek yogurt( carmel flavor) most of the time I just use the plain. And about a half cup of almond milk. Really good but the Hodgens would be better because of the ingredient list! @Janet - it doesn't taste like pumpkin - it is just really moist. @Kim - yes, use egg substitute - that will work. 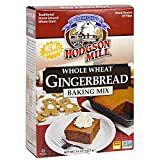 I looked for this Hodgson Mills product in a couple of local supermarkets but could not find it. I went to their website and they have a product locator request tab there. Someone from the company sent me a personal response to my request so I was able to find it at another store. Great customer service and I'm looking forward to making this tonight! Can't wait to try this - and I just got your cookbook in the mail yesterday! I found this mix at HEB grocery store. Yay! I am in Texas. I am trying it out this weekend! Sounds awesome - and consider the mix as being 'efficient', not cheating - especially since you recognize the ingredients! Tried this recipe this weekend for a dinner party. The host always makes a pot of coffee at the end of the night and i thought this would make a great "coffee" cake. Best idea. 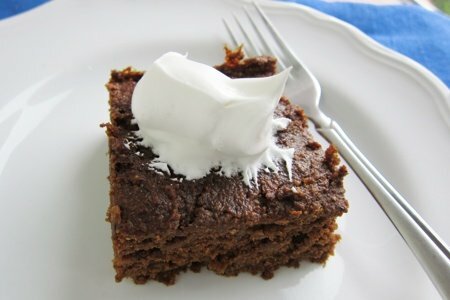 It's dense like a brownie so you don't need to eat too much in one sitting and sooo moist. Tasted more like gingerbread than pumpkin. Absolutely delicious. Will def make again!